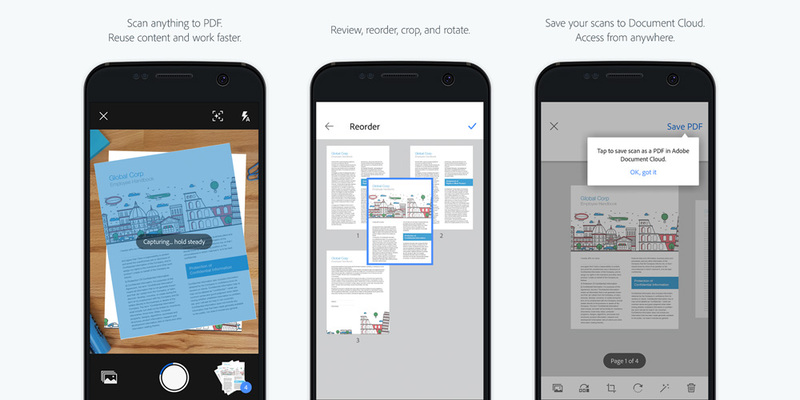 Adobe has introduced a few hours ago a new application developed specifically for mobile devices (Android and iOS) that can scan documents and convert them into digital text as if it were previously printed, all in a matter of seconds. Its name is Adobe Scan, and unlike many other OCR applications, it is a completely free app, does not use watermarks and has no limit of pages to convert. And it's available in the Play Store. We are many users who, for work or study, use our smartphone or tablet with the aim of saving documents and leaflets written directly on the device. The ultimate goal, beyond having images on which to zoom, is often the capture and digitization of text. All of this can now be done, in a moment, with OCR software, which can recognize printed text and convert it into digital characters to be used in more extensive ways. Capture: Can capture any document accurately. Advanced imaging technology automatically detects the edges and increases the sharpness of captured content. Enhance: Retouch the scanned images or the photos taken. You can view, sort, crop, rotate and adjust color easily. Reuse: Converts scanned images into high-quality Adobe PDF to unlock content through auto-text recognition. The free Adobe Scan application turns your device, in short, into a powerful portable scanner that can automatically recognize the text (OCR). Convert any document (receipts, notes, documents, images, business cards, whiteboards) into an Adobe PDF with content that can be checked anywhere and on any device. Adobe Scan, in fact, has no limits, even allows you to scan documents to multiple pages and save them in Adobe PDF format also in Adobe Document Cloud, to access them and share them instantly. The digitized images are taken according to a special algorithm that allows to take the appropriate actions to transform the scanned text. Thanks to a number of features included in the application, you can also search for words in the text, highlight key sections, add notes, and convert to Microsoft Office.